Bukele has consistently polled as the most popular politician in the country, the favorite to win reelection as mayor in 2018, and the leader by a wide margin over any other possible candidate for president in 2019. None of that mattered to the FMLN leadership, however. 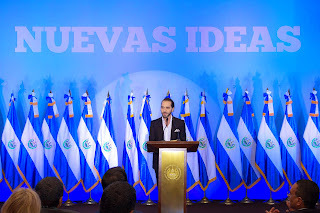 Bukele lacked the necessary ideological purity, he was not one of the former guerrilla fighters, he had often publicly disagreed with party leaders. His profile was higher than any of the leaders of the FMLN and he did nothing to advance other aspects of the left wing party's agenda. What is next for Bukele is not clear. Shortly after the FMLN's decision was announced, Bukele tweeted a Wikipedia entry now showing his party affiliation as "independent." El Salvador election laws allow independent candidates for mayor, so he could run for mayor without a party affiliation. Or Bukele could start working on a presidential bid. He might form a new party or one of the smaller parties might try to recruit him. One thing which does seem likely -- the FMLN is not going to retain the mayor's office in San Salvador after the March 2018 elections.